Tasso gravy is often made with cream and there's nothing wrong with that. Nothing at all. When you are cooking light though, this no-cream recipe skimps on calories and fat, but not on taste. Pair it with your favorite starch. Pictured here: nutty brown rice. Mix the flour and seasoning together on a plate. Press both sides of the chops into the flour mixture to lightly coat. Heat the oil in an oven-proof saute pan. Saute the chops over medium-high heat for 3 minutes per side. Transfer the chops to a 350 degree oven for another 5 minutes for medium chops. Melt the butter over low heat. Add the tasso and saute for about a minute. Add the flour and stir until combined. Continue to cook the flour mixture over low heat for 5 minutes, stirring constantly. Raise the heat to medium and add 2 cups of the broth, stirring constantly, until creamy. Slowly add the remaining two cups of broth, while continuing to stir until thickened. Reduce the heat and simmer for 15 minutes, stirring occasionally. Add the parsley and simmer for another 5 minutes. Add salt and pepper to taste. Treebeards Restaurant has been serving Southern food to Houstonians for over 30 years. The iconic restaurant has been a favorite weekday lunch destination for generations of downtown workers who make their way to the parish hall of Christ Church Cathedral (est. 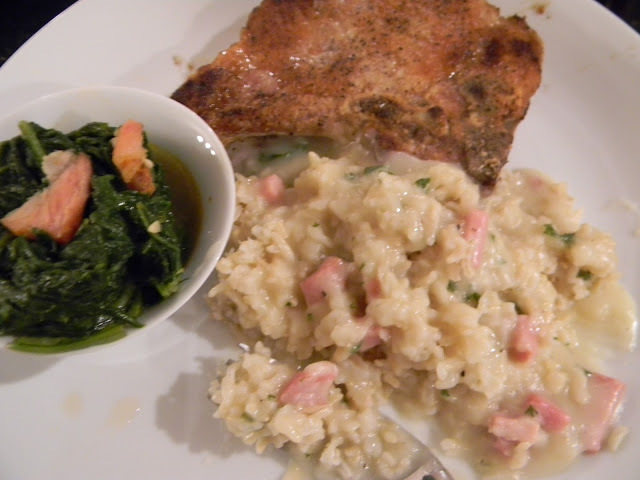 1839) for red beans and rice, jambalaya and a version of these greens. If you are ever in town, experience Treebeards at the Cathedral or at Market Square. Remove tough stems from the greens and roughly chop them. Rinse them in cold water. In a large pot, bring 6 cups of water to a boil. Add the 4 teaspoons of oil and the greens. Cover and cook over medium-high heat for 15 minutes. Drain the liquid and set aside. In a small saute pan, cook the tasso ham in the 1/4 cup vegetable oil with the garlic and Slap Ya Mama Seasoning for 3-4 minutes. In the same pot where you cooked the greens, bring 3 cups of fresh water, fish sauce, tomato paste and salt to a boil. Add the greens and the tasso mixture. When the liquid begins to boil again, remove from the heat. Serve in a large bowl with tongs and let the greens "drip" in the bowl. The liquid, called "potlicker," is best sopped with a crusty piece of French bread or cornbread.